This traditional Chicken Piccata Recipe got a much healthier makeover! If you love this popular Italian dish but are afraid it may be too many Weight Watchers Points, then this healthier version will make your day. Just by using less butter, and a lighter version of it, this Chicken Piccata still maintains the buttery flavor, but for a lot less fat and calories. It’s also bulked up a bit with some mushrooms. And of course, the velvety, piccata sauce is divine with the delicate flavor of wine, the acidity of the fresh lemon, and the zing of garlic. Each serving is lower in fat and calories, making this one very low Points Weight Watchers dinner recipe. If you love Chicken Piccata, this is a must make. Enjoy! This succulent and decadent classic Chicken Piccata tastes almost too good to be low calorie. 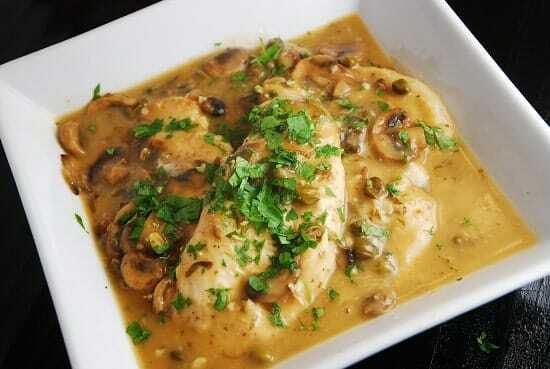 The tender and juicy chicken breasts are served in a traditional lemon butter sauce with capers. In a small bowl, whisk 2 tbsp of flour and 1 cup of broth until smooth. Place the remaining flour in a shallow dish. Season chicken with salt and pepper, then dredge chicken in the flour. Spray a large nonstick skillet with non-fat cooking spray and setover medium heat. Add the chicken and cook until browned and no longer pink in the middle, 2 to 3 minutes per side. Transfer to a plate; cover and keep warm. Place butter in the pan and set over medium-high heat. Add mushrooms and cook, stirring, until they release their juices and begin to brown, about 3 minutes. Add garlic and wine to the pan and cook until reduced by half, 1 to 2 minutes. Stir in the reserved broth-flour mixture, the remaining cup of broth, the lemon juice, paprika, and additional salt and pepper. Bring to a simmer and cook, stirring, until the sauce is thickened, about 5 minutes. Stir in parsley and capers. Add in chicken breasts and let simmer on low for about 5 minutes. Serve chicken smothered in sauce, and topped with some additional chopped parsley. I tried this recipe tonight and it was delicious! Will be making it again soon! I made this recipe tonight and it was delicious. 4 points, 6 points. Either one, it was a terrific dish, and I’ll make it again. Note: if you use mini Bella’s, the sauce will be much darker and will bring along a little earthy tone. Delish! What are the calories for this dish please? Do you have the nutritional info for this dish? Calories, Fat, etc. Thanks! Once again, thank you for this awesome recipe. It was absolutely delicious and so easy. I feel that my weight loss journey can now be a gourmet experience rather than a boring same old, same old… which is difficult to sustain for the long term. Thank you, thank you, thank you. This is yummy, but I put it in the recipe builder and it came out at 6 points plus? This was very tasty…. but, I too, put it into the recipe builder and it came out as 6 points plus. Still a very good recipe but the points should be updated. thanks! This is the problem with that Weight Watchers Recipe Builder…it’s not really accurate. The Points + values I calculate is from the exact nutrition stats of all the ingredients I use. The WW Recipe Builder uses an average of all the nutrition stats available for each ingredient. I rarely ever find it on point, and never use it. The best thing you can do is to add up all the information from your ingredients and calculate it out. I do weight watchers and 4 or 6 points WHO CARES!! It was deelish! Do you have an IG or cookbook? Cant wait to try more of your stuff! Keep the recipes coming! !